Do you enjoy bicycling and seeing new places? If so, you’d be hard-pressed to find a better mix than bicycling in Europe during your river cruise. In August, I did just that, traveling with my 19-year-old son on a “bikes and boats” trip with AmaWaterways and Backroads. As regular readers of River Cruise Advisor know, AmaWaterways is a multi-awarded river cruise company. Not as well known among RCA’s readers, Backroads bills itself as the world’s #1 active travel company. The combination of cycling and river cruising was a match made in heaven, and a perfect way to travel for this father and son duo. Our Backroads/AmaWaterways group in Budapest at the end of a wonderful week. We used AmaSonata as our floating hotel, while Backroads took us bicycling each day along the Danube. “Dad, this may just be our best trip ever,” Alex said to me at the start of our trip. We were pedaling at the time under blue skies on a bike path through forests, making our way to the Danube, where AmaSonata was waiting for us in Vilshofen, a German city on the Danube that AmaWaterways uses for turnarounds (where its cruises begin and end). The ride that day was exhilarating, with more than 20 of us participating in the Backroads program, and it was only a sign of what was to come. 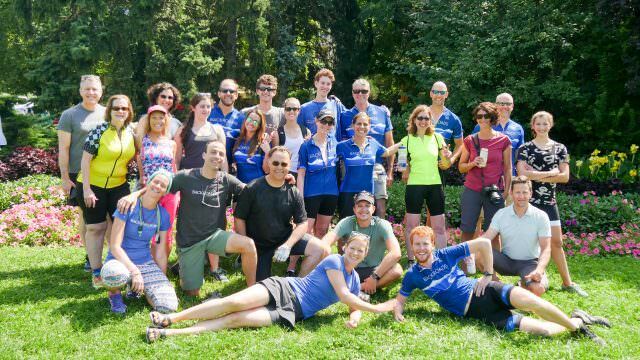 Each day, we’d pedal along beautiful stretches of the river, feeling invigorated by the landscape, the fresh air, the activity and group camaraderie. Backroads blocks group space (and sometimes charters the full ship) to layer its program on top of AmaWaterways’ river cruise product. There’s a premium to be paid for the Backroads program. For example, on the June 5, 2017 departure on AmaCerto, which runs seven nights from Vilshofen, Germany to Budapest, Hungary, Backroads’ rates begin at US$5,998 per person for a category BA stateroom measuring 210 square feet. On the same cruise, AmaWaterways rates begin at US$4,048 per person, but this is for a category C stateroom measuring 170 square feet. Both are based on double occupancy. Not only is the Backroads stateroom larger but it comes with both a French balcony and a step-out balcony, as opposed to a French balcony only in AmaWaterways’ category C pricing. Had I been able, I would have compared apples-to-apples, that is to compare the same stateroom category. But pricing for each category was not available on the respective websites of each company. Other than the larger stateroom, is the Backroads’ premium worth it? If you enjoy cycling, yes. Backroads provided us with an upscale bicycling experience. The team leaders took care of every aspect of our journey, from detailed instructions about our rides to giving us choices (and freedom) to make our own way. We were not shoe-horned into a cookie-cutter, one-size-fits-all program. Plus, our lunches were often taken off-ship, in interesting locales and at Backroads’ expense. Some lunches would have easily cost US$50 or more for Alex and me. The condition of the bikes was excellent, and the riding was euphoria-inducing. Our longest day, from Vienna to Bratislava, had us covering nearly 50 miles, under such great conditions and with a stop at a beer garden (though it was only mid-morning, it’s beer o’clock somewhere) and lunch at a castle, again, all of this taken care of by Backroads. We rode into Bratislava feeling as though we had just finished the Tour de France, victorious and feeling tired but euphoric. As my son suggested at the outset, this trip certainly ranked among our best ever. The combo of AmaWaterways and Backroads is a good pick for those who want to be active during their vacations and also for those who want to experience Europe at just the right pace and in just the right style – on two wheels and along a river. Want To Experience Backroads Bicycling & River Cruising? In 2017, Backroads offers 58 departures on the Danube, Douro, Rhine and Seine rivers. 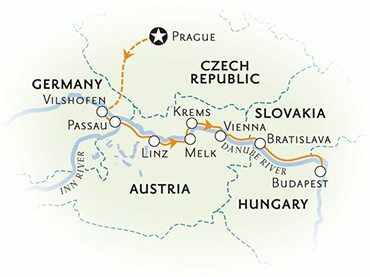 Prices begin at US$5,198 per person for the 8-day Danube Cycling Sensation River Cruise Bike Tour.